Ken Walker, technologist in charge of computer animation at the Sheridan College Institute of Technology and Advanced Learning near Toronto, Canada, had a big transition on his hands back in 2000. He decided it was time for a bold move: It was time to revamp both the hardware and software that the 95 students in three different post-graduate programs at the Institute were using for all of their computer animation and video projects. Big changes were underfoot in the computer graphics industry in those days. 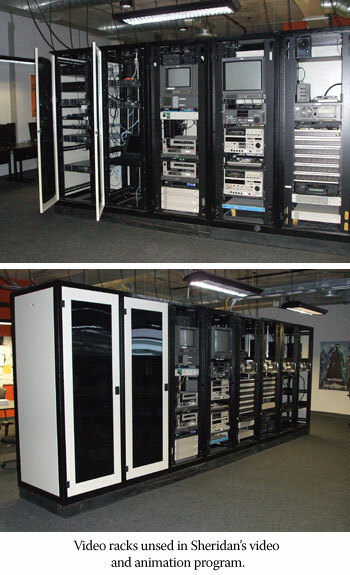 Walker's 100-seat postgraduate animation facility was populated with computer workstation hardware by Silicon Graphics, the now-defunct workstation manufacturer whose high-priced, heavy-duty computers using industrial-strength UNIX software were steadily losing favor in the industry. It was getting increasingly more difficult for the hardware giant to compete because of its high prices, facing a juggernaut of lower-priced off-the-shelf Intel and AMD-based PC workstations. It was a time of change and innovation for the school as well, which was in the midst of building a new wing at the college, the Sheridan College Center for Animation and Emerging Technologies. While that building project was underway, an ambitious plan to make sweeping changes throughout the program was hatched. Until that point, the postgraduate program revolved around a graphics and animation software program called Softimage, but Walker wanted more for his pro-level animation students and searched far and wide for other software that might be more appropriate for their advanced needs. Maya, a powerful software modeling and animation program then owned by Alias and now by Autodesk, was chosen. Walker had good reasons for making the software switch. Of all the animation software packages, "it's one of the most popular," he said, emphasizing that concentrating on software that is used industry-wide is important in an educational environment, and Maya was unquestionably becoming a more widely favored and used by the professional content creation community. In addition, Walker trusted the software's developer, Alias, which was based in Toronto, just a few miles away from Sheridan College. "It was a local company, and we had a good relationship with them," he said. More importantly, Walker added, "At the time Alias was coming out with a newer, more-innovative piece of software." Just prior to the year 2000, the company's software wasn't well known for its animation abilities. Said Walker, "But they had written a brand-new set of tools in the year 2000 for that, and we looked at it and said, 'These will do the job, and they will also be improving them as we go,' so we figured that would suit us best." That did it. Walker decided since he was already making a big change in hardware, he might as well move the software over to a package that he thought was superior as well. Even though these huge changes seemed daunting to Walker at first, the implementation of the new hardware and software turned out to be less complicated than he had anticipated. "At first I thought, 'Oh no. How am I going to do all this?' I was thinking about how we were going from a UNIX-based world where reliability was really high and stable, to a PC-based world." Walker had heard a lot of horror stories, and assumed there would be multiple system crashes using the untested Windows Software and Intel and AMD-based workstations. Beyond that, Walker didn't feel familiar enough with the Windows operating system and its associated server software to make the implementation go smoothly. "I wasn't sure if I would understand the structures and things inside the Windows server OS," Walker explained. However, his fears turned out to be unfounded. "There are so many similarities, and if you understand the structures, it wasn't that hard to switch from one to the other, at least not for me." How did Walker overcome this difficulty of moving from one software and hardware world to another? "I asked a lot of questions, and went on to some forums online," he said, stressing the importance of consulting with experts in the online community, who often are delighted to assist newcomers. He also found valuable help from the software providers that sold him the Maya animation packages. "The good folks at our local software resellers helped me along, too." Walker had mixed feelings when he recalled the challenge of implementing all-new software and hardware in his large or computer department and lab. "It was painful, yes, but the transformation wasn't horrible," he added. Looking back on his experience, Walker is now delighted that he made the switch. 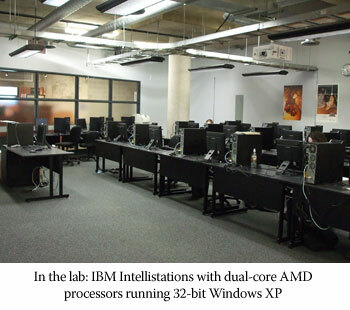 Both the server based and workstation-based versions of Windows XP have improved considerably in the last seven years, and the IBM Intellistations with dual-core AMD processors running 32-bit Windows XP have proven themselves to be rock solid and dependable. However, Walker's work is never done. Now he's learned that a new version of Maya has just become available. "Just [in mid-January] they came out with 8.5. I need to decide what I'm going to do with that." Something tells us that when the time comes for that upgrade, Walker will be ready, just like he was the last time.